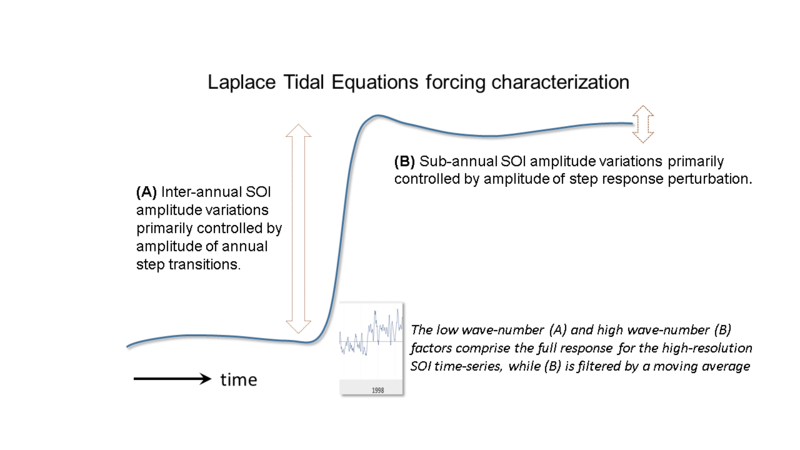 As we describe in Chapter 12, a closed-form analytic solution to Laplace’s Tidal Equations (LTE) provides an excellent fit to the monthly ENSO time-series, and in particular to the signature Darwin-Tahiti SOI standing-wave dipole behavior. For resolution finer than monthly, the SOI behavior appears very noisy to the eye (see below and click to enlarge). The question is whether that is truly stochastic noise or an aspect of the LTE solution that has yet to be revealed, and that may represent higher wave-number (i.e. non-dipole) behaviors, such as from Tropical Instability Waves (see below) and other rapidly oscillating waves above these in wave-number. To model the hi-res SOI data applying the LTE solution, two sets of multiplicative factors are configured for the fitting algorithm. The monthly time-series extending back to 1880 aligns the low-wave-number factors, while the daily time-series optimally selects the high-wave-number factors. The common basis is the annual lunisolar impulse that produces a step-like response, and which feeds into the LTE formulation. In short, the overall step response multiplies the longer wave-number factor leading to inter-annual variations of several years; while the shorter wave-number factor multiplies the slight perturbation to the step response, as shown below. 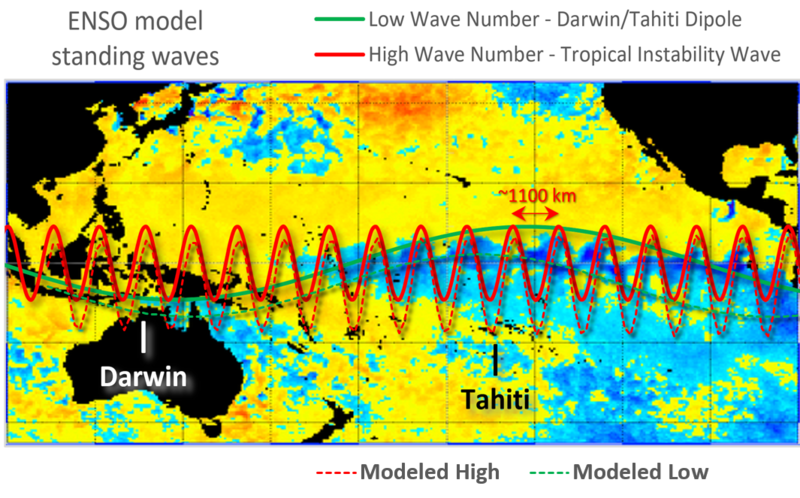 The initial fit below attempts to validate out-of-band agreement between model and data. The top panel is a fit to the conventional monthly SOI time-series, which is simultaneously fit to four El Nino episodes during the daily monitored interval stretching from 1992 onward (as shown in the lower panel). As can be seen, the high-frequency cycles lock in over the relatively short fitting intervals, and then also align outside of those intervals, indicating strong out-of-band validation. Optimizing over the entire 1992-present interval generates the following. The bottom-line is that it is difficult enough to model ENSO over the entire monthly range extending from 1880-present, but then to require that as a strong constraint while simultaneously matching (with a nearly 0.8 correlation coefficient) the high frequency daily SOI variations is multiplicatively difficult with the limited degrees-of-freedom available. The conclusion we can draw is that the high-frequency content of SOI is not noise, but a characteristic of the LTE solution.